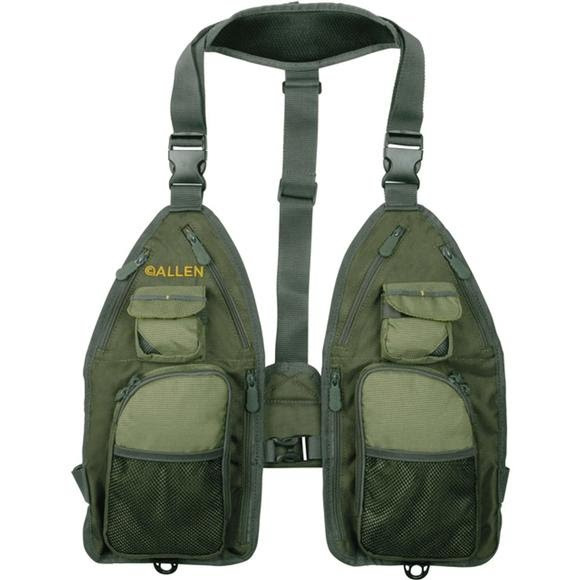 The Allen Co's Gallatin Ultra Light Strap Pack has a lightweight design that maximizes storage capacity. With a padded neck strap and net D-ring, this one size fits most pack features zip close front pockets that hold large fly boxes, a large interior stretch mesh pocket for boxes or gear, high-viz lining, plus multiple exterior storage pockets. The Allen Co &apos;s Gallatin Ultra Light Strap Pack has a lightweight design that maximizes storage capacity. With a padded neck strap and net D-ring, this one size fits most pack features zip close front pockets that hold large fly boxes, a large interior stretch mesh pocket for boxes or gear, high-viz lining, plus multiple exterior storage pockets. Comes with exterior D-rings for your accessories and heavy-duty molded zippers. Measurements 16" x 2" x 1"